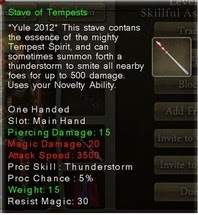 This is your guide to the Yule 2014 Winter event in Celtic Heroes that ran from December 19, 2012 to May 6, 2013. I'll be showing you new bosses, quests, luxury items, mounts, fashion, weapons and mobs along with maps and info about each part of the event. They also had guards flanking them. These bosses now appear as rare spawns without the adds. Lord Grimling (level 60/6*) - Beach West of Lighthouse. Moved to West of Highshore. The weapons they drop are very powerful, but very slow. They also are two handed, even the bows so you cannot use an offhand with them, not even a quiver. They also have a strength requirement to use them. 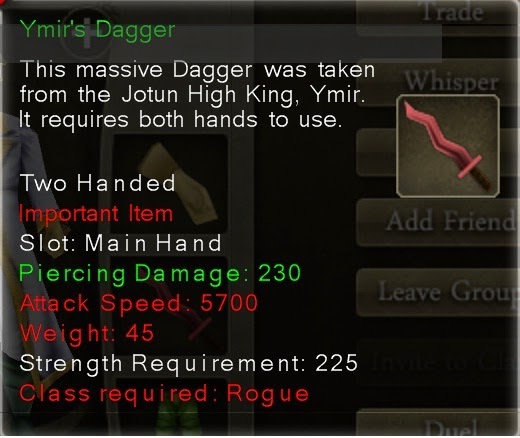 These are similar to the Winterking weapons of Yule 2011. In the field behind Highshore Village a huge cloud called the Tempest Spirit spawned. This boss dropped one of three wands. They would drop snowballs of different strengths that you can throw at mobs. Sometimes they would drop a rare cloud mount that added no speed boost, or a Yuletide Cloud Hat that had an electricity particle effect on it. This is the only hat that had electricity as an effect. The Yulefather was in the castle giving a quest to have you gather presents from around Lir's Reach. He would reward players with a randomly colored Yuletide Helper's Hat. This was the first event that used randomness to determine the color of the hat you get. These crakers werer lying around Lir's Reach to be picked up. When you used them they added a particle effect to your character for a few seconds. These are similar to the cakes in the first birthday event. Golden Cracker - Sold to shop for a good price. Does not add effects. The mount shop for this event was by the waterfall near the tavern, and sold cloud mounts. The fastest one added 70% speed. At the beginning of the event the mount shop was bugged and had a high priced chicken in it. This was fixed with a patch not long after, and mount prices were reduced.